I always tell my clients that when it comes to buying a house, it’s never too early to start with the planning. As early as high school or college, in fact. If your goal is working with young homebuyers, I’m sure you will agree that establishing a good base for a credit score is vital for loan application success in the future — and it eventually doesn’t matter if their goal is to borrow money to buy a car, an expensive gaming pc or even a house. Loans are loans, and a good credit score is necessary. 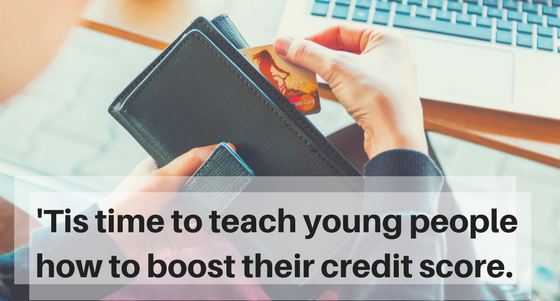 A great many young people have little to no idea about how credit scores work, and what they can do to improve theirs. Let’s give them a hand, and make taking loans for big purchases a thing young people can do. Bankrate discovered recently that only a very small number of millennials have a credit card (33% to be exact). The main concern young people have with using credit cards is the high amount of debt that previous generations had (or still have) to face, due to their irresponsible use of credit. A smartly-used credit card can actually be a great help down the line, because it gives a considerable boost to a young person’t credit score. Getting a credit card, paying it off regularly and keeping the spending well below the credit limit — that’s literally all it takes to start your way towards an improved score. The way a young person pays off their student loan debt is the way they treat their credit score. Responsible and regular installments are a huge plus, because they are the one certain item on a young person’s credit score analysis. Each loan taken out is a fresh new line of credit that plays a big role in a person’s financial history. Make your student loan payments in a timely manner, and don’t skip any payments, and you’re one step farther down the line to a great credit score. If a young person really wants to stay away from credit cards, doesn’t have a student loan, or is looking for a different solution for any other reason, a credit-builder loan is a sensible option. It’s not difficult and it’s quite secure, because the person is basically borrowing money only for the sake of paying it back. As soon as you pay the debt off, you actually get the money. The way it works is, you take a “loan”, but the money is put in a savings account that you can’t access. You pay the loan back like any other loan, and at the end, you get access to the savings account. So it’s rather a win-win. You end up saving money, and you grow their credit score significantly (an average of 65 points in just 6 months) — provided that the payments took place on time. Last Word: You Gotta Start Now. Really. I’ve talked about financial literacy of young people before. It’s of utmost importance that we, the professionals in the field — especially if we’re aiming to work with young prospective homebuyers — offer guidance and education that will help a young person make informed, consistent and conscientious financial decisions. Bad credit combined with low knowledge of options is not a great way to enter adult life. Let’s do our best to help our clients take the first steps, well-prepared and confident.